which recently was granted Japan Heritage status. This page introduces an example itinerary that will let you fully experience the area’s appeal. Above: Mt. Imose provides views of the area’s expansive tidal flats. Mt. Nagusa can be seen on the left, while Kataonami and its beautiful green pine trees can be seen on the right. This scenic beach extends toward the estuary of the Waka-gawa River. The area near Mt. Imose, a small island in the nearby ocean , is dotted with famous destinations like Sandan-kyo Bridge , Shiogama-jinja Shrine , Tamatsushima-jinja Shrine , and Furo-bashi Bridge . On Day 1 of your trip, you’ll get off the train at JR Wakayama Station and take a bus south as you gaze at Wakayama Castle on your way to Wakanoura, where the tidal flats extend into the estuary of the Waka-gawa River. You’ll get off the bus at the Furobashi stop, where you’ll see the landscape of the tidal flats against the backdrop of Mt. Nagusa, with the sand spit known as Kataonami extending towards Kuroe. First, you’ll cross Sandan-kyo Bridge to Mt. Imose. 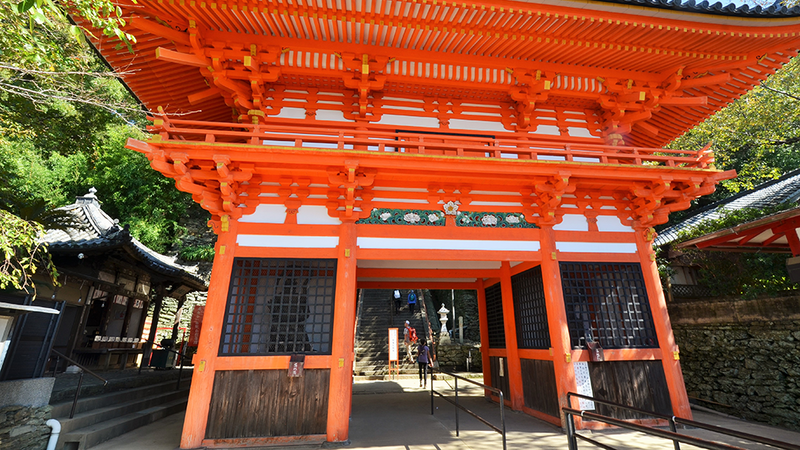 After enjoying the panoramic views from the mountaintop, you’ll visit Shiogama-jinja Shrine and Tamatsushima-jinja Shrine. For lunch, you’ll visit Wakaya Tsuya, a local restaurant that’s famous for its dried fish. If you’re lucky enough to be visiting on a Saturday, Sunday, or public holiday, Ottotto Plaza is worth a look, too. As you return across Furo-bashi Bridge, you may notice that the ebb and flow of the tide have caused the appearance of the tidal flats to change. 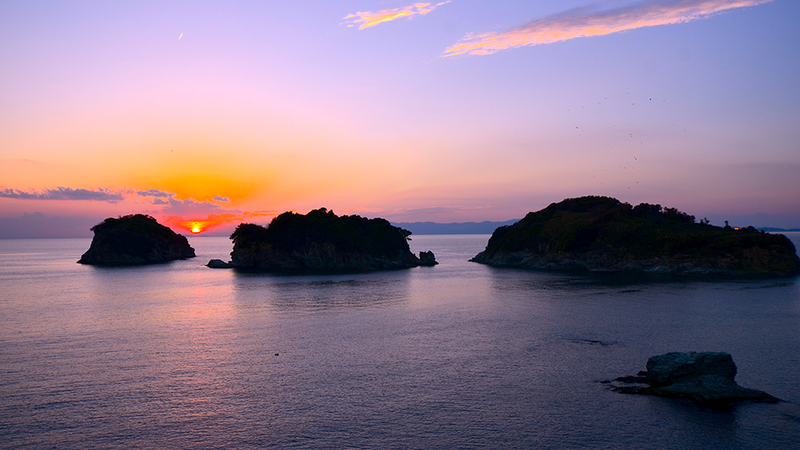 Give some thought to the scenery of Wakanoura, which inspired Man’yo era poets to pen their works. Next, it’s time to visit Kishu Tosho-gu Shrine and Wakaura Tenman-gu Shrine, which stand halfway up in the mountains. If you look back while climbing the steep pilgrimage route that leads to these shrines, you’ll see a magnificent landscape made up of the Nagamine mountain range, through which the Kumano Sankei-michi Pilgrimage Route Fujishiro-zaka Slope, and the surrounding ocean. After pausing to enjoy some waffles at Junkissa Lierre, you’ll head to Cape Saikazaki by bus. The magnificent landscapes you’ll see at Bandoko Teien Garden and the Cape Saigasaki Lighthouse are made up of the same scenery that inspired the Man’yo poems of old. Spend the night at an inn where you can soothe the fatigue of your travels while enjoying the beautiful nighttime scenery. The shrine enshrines Tosho Okami (Tokugawa Ieyasu) and Nanryu Okami (Tokugawa Yorinobu). This shrine was built in 1621 by Tokugawa Yorinobu, the first ruler of the Kishu domain, to enshrine the spirit of his father Ieyasu. The area round its main shrine and hall of worship, which feature gorgeous carvings and wall paintings, is open to the general public (admission fee applies). 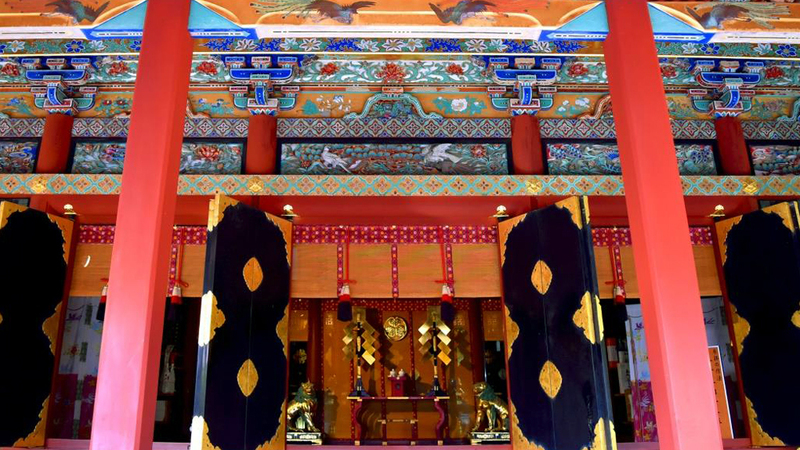 Cost, hours, and days closed: The shrine’s grounds are open to the general public (guided tours of the main shrine and hall of worship are available for \500). The magnificent main hall stands atop a steep, cobblestone-paved pilgrimage route. The gorgeous buildings of this shrine, which were rebuilt by the feudal lord Asano Yoshinaga in 1606, stand halfway up Mt. Tenjin. Its two-story gate and main hall, among other structures at the site, have been designated Important Cultural Properties. A monument engraved with a Man’yo poem marks scenic views of Saikaura. The Kishu domain maintained a lookout post at this location. 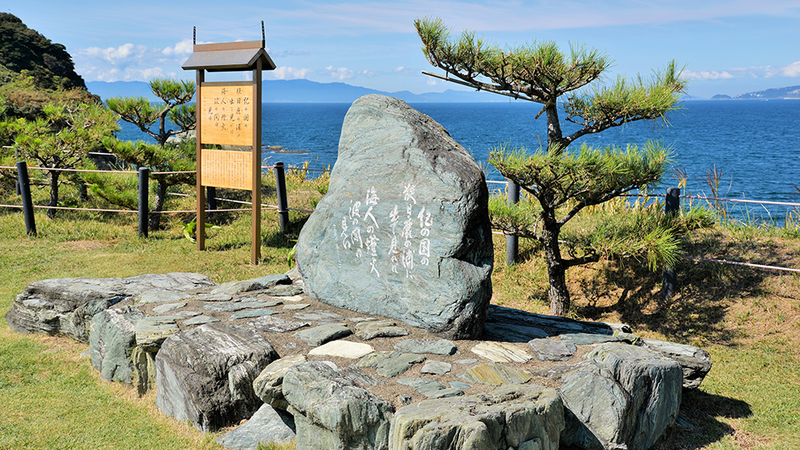 A monument engraved with a Man’yo poem that is said to have been written by Fujiwara Kyo on the occasion of Emperor Shomu’s imperial visit to the area marks a spot with scenic views of Saikanoura. Getting there: Located 12 min. on foot from the Saikazakiyuen bus stop. The lighthouse is famous for its views of the sun as it sets behind the silhouettes of the area’s islands. This lighthouse sits atop the steep cliffs of Cape Saikazaki, which is also known as the “falcon’s nest.” A viewing area offers views of islands such as Futagojima Island and Awajishima Island in the distance. The lighthouse is also famous as an excellent place from which to enjoy the setting sun. Getting there: Located 15 min. on foot from the Saikazakiyuen bus stop. Cost, hours, and days closed: The lighthouse is open to the general public. 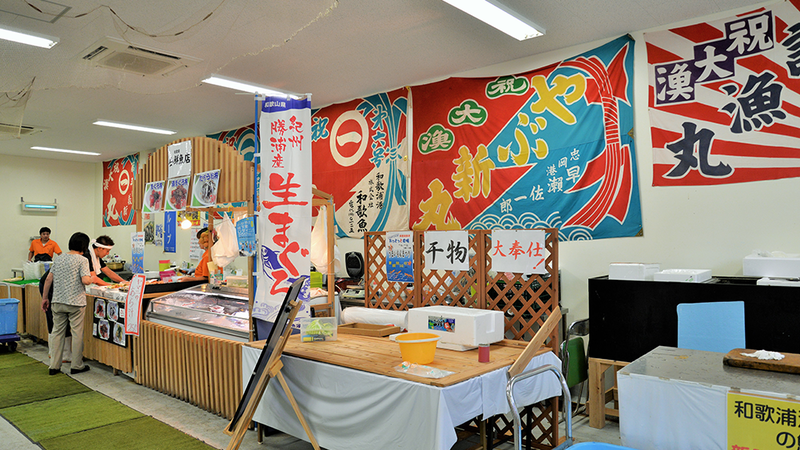 The shops in a building at the Fishing Port of Wakaura sell seafood and processed seafood products. 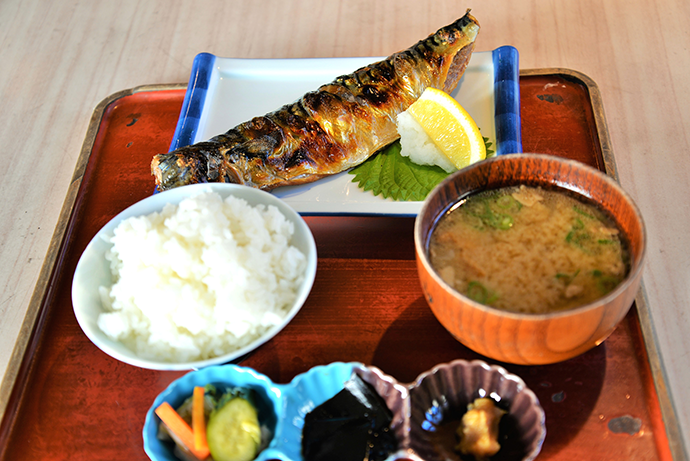 Try treats like a bowl of rice topped with wakashirasu fish. Getting there: Located 3 min. on foot from the Shinwakaura bus stop. Take a Wakayama Bus bound for Shinwakaura and get off after about 20 min. at the Furobashi stop. Take the Wakayama Bus Saikazaki City Shuttle from the Gongenmae stop, which is about 5 min. on foot from the cafe, for about 15 min. and get off at the Saikazakiyuen stop. Then walk about 12 min. Walk or take a Wakayama Bus to the inn. The temple provides sweeping views of Wakaura Bay and Kataonami. 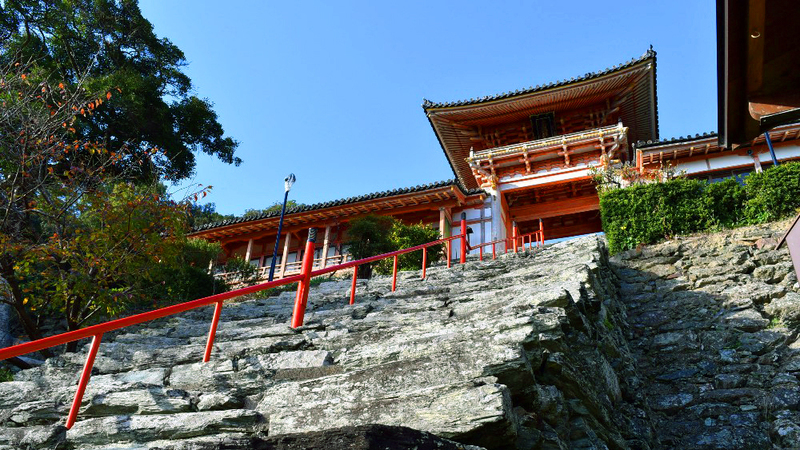 On Day 2 of your trip, you’ll visit Kimii-dera Temple, which is located halfway up Mt. Nagusa. 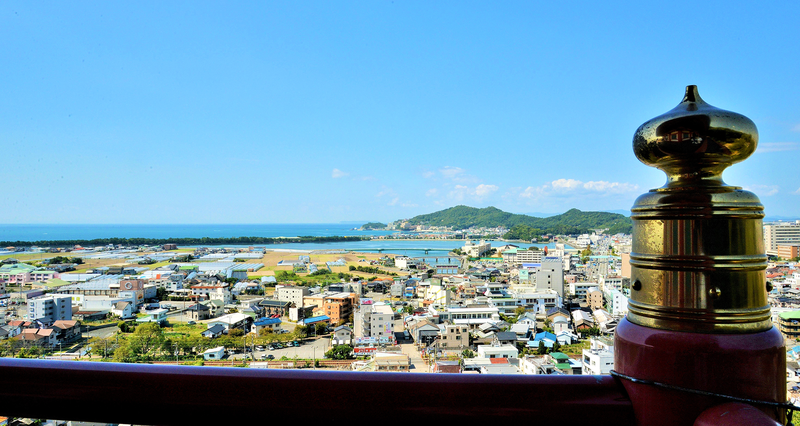 Check out the view of Kataonami in the distance. Then you’ll head to the city of Kainan by bus and stroll through Kotonoura Onzanso Garden, where you’ll enjoy the feel of the salty breeze on your skin. 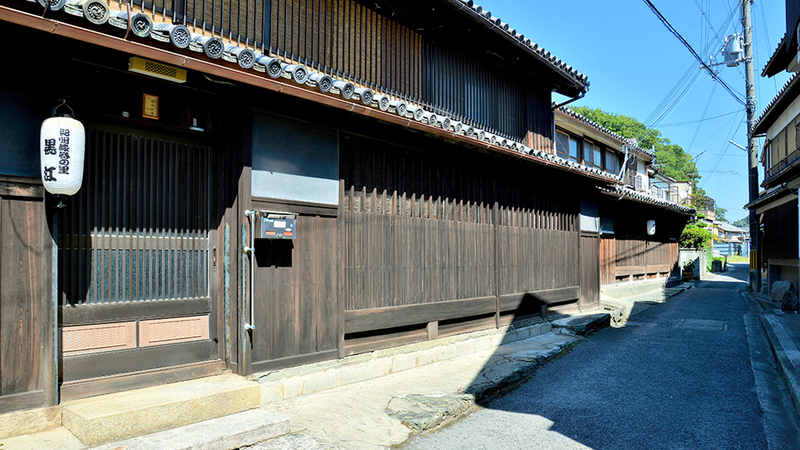 After enjoying lunch at Michikusa, it will be time to stroll through the townscape of Kuroe, where you’ll try your hand at making gold or silver lacquerware at the Kuroe Lacquer Museum, which is part of the Kishu Lacquer and Traditional Industry Center. Then it will be time to head back home from JR Kainan Station with a souvenir that’s one of a kind. Located halfway up Mt. Nagusa, this ancient temple is named for three miraculous springs that bubble up on its grounds. It attracts numerous pilgrims as the second stop of the Saigoku Kannon Pilgrimage’s 33 temples. The water level in the pond rises and falls with the ebb and flow of the tide. 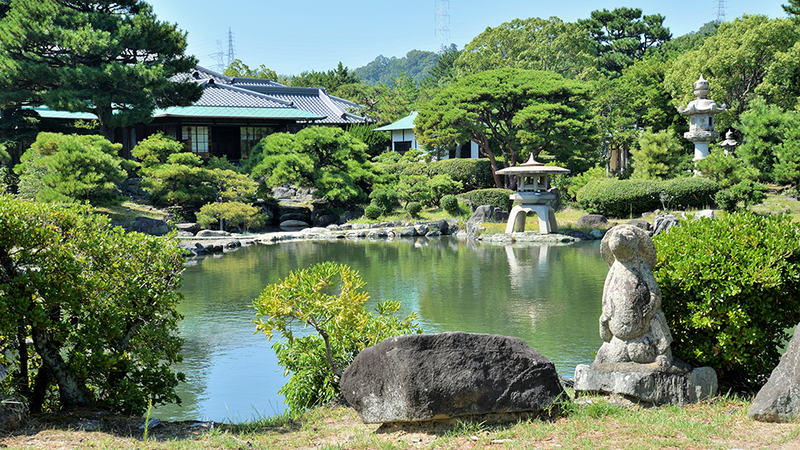 Originally build as a vacation home for businessman Chojiro Nitta, Kotonoura Onzan-Souen Garden is now open to the general public. You can stroll through its expansive circuit-style garden, which features a seawater-fed pond and which was built at the beginning of the Taisho period. The main house and two other structures have been designated Important Cultural Properties. Your finished piece will make a great gift. 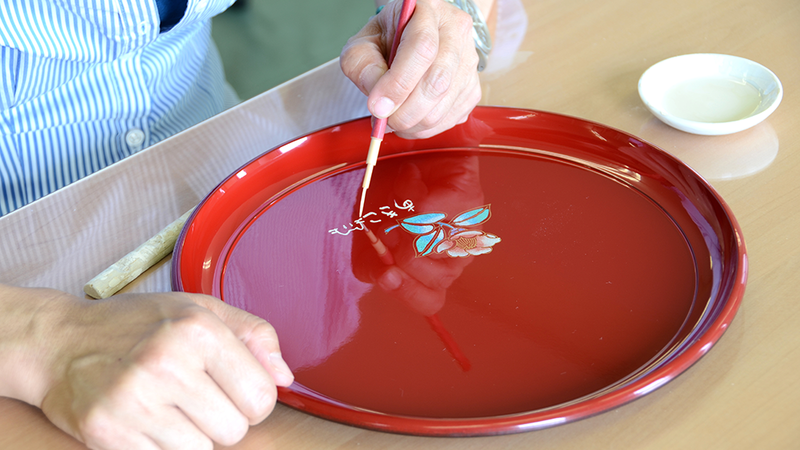 Experience making gold or silver lacquerware, a traditional technique associated with Kishu lacquer utensils. You’ll need to contact the museum in advance to make a reservation. Small, round trays start at \1,000 (prices may vary). Take a bus on the Wakayama Bus Saikazaki Line for 11 min. from the Saikazakiyuen stop. Change to a bus bound for Kainan Station at Suikenguchi and ride for another 8 min. before getting off at Kimiidera. Then walk 5 min. Take a Wakayama Bus bound for Kainan Station from the Kimiidera stop, which is 5 min. on foot from the temple, and ride for another 6 min. before getting off at Kotonoura. Take a Wakayama Bus bound for Kainan Station from the Kotonoura stop and ride for 1 min. before getting off at Kuroe. Take a bus bound for Kainan Station from the Kuroe stop, which is 5 min. on foot from the Uruwashi Museum, and ride for another 6 min. before getting off at the last stop. This renovated building, which used to house the Wakagawa Fish Cooperative, is now a cafeteria serving dishes prepared with local ingredients. Try the oven-cooked rice and dried fish prepared using a special ash drying technique. Getting there: Located in the immediate vicinity of the Wakaura bus stop. This restaurant serves an extensive range of fresh cuisine prepared using fish caught locally in Kainan. 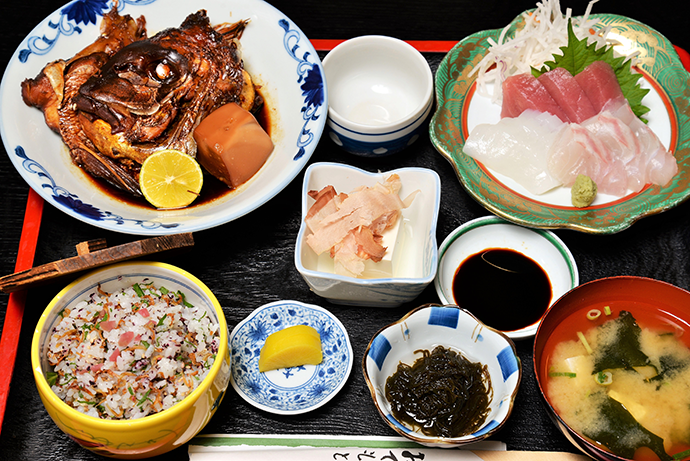 With simmered fish and sashimi, the popular seafood set offers plenty to fill you up. Getting there: Located 4 min. on foot from the Kuroe bus stop. Unzanbankaso, a vacation villa that was originally owned by Okazaki Kunisuke, who became the Minister of Agriculture and Forestry of the Meiji government after serving as a vassal in the Kishu domain during the Edo period, has been converted into a cafe. 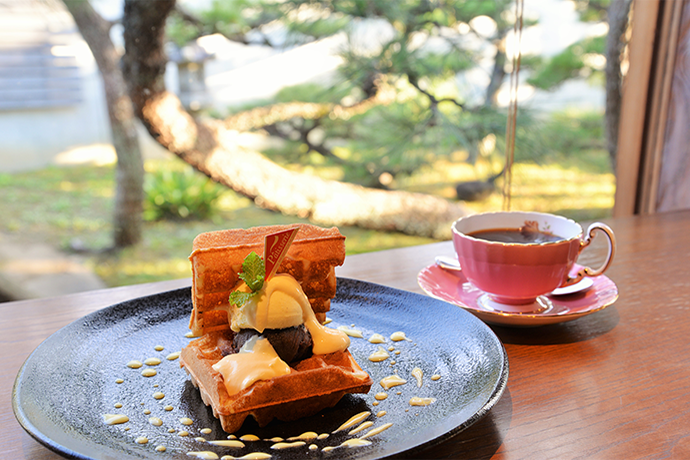 Enjoy waffles in a Japanese-style building that’s 130 years old. Enjoy the “Waffle-dora” dish with a drink for \1,080 as you gaze out at the surrounding garden. Getting there: Located in the immediate vicinity of the Furobashi bus top. 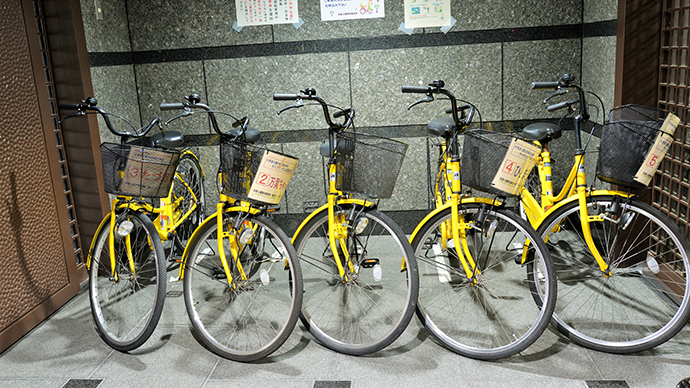 You can borrow a bicycle for a day free of charge from the Health Center located on the first floor of the Manyo Hall (see page 6). The Center is open from 9:00 am to 5:00 pm. Inquiries should be directed to the Waka Park Office.